Attain the ultimate home theatre display with this stunning Shaker style design from the Arbutus Collection. Featuring adjustable shelves and wood framed tempered glass doors this new TV bench is the perfect platform for TVs up to 70. With a variety of open and concealed storage solutions this bench is the perfect way to maximize your living space while adding style to your home theatre display. Admire the elegant and transitional design in the new TV Bench from the Jackson Collection by CorLiving. This timeless staple item is featured in our Black Wood Grain finish accented with imitation nickel handles, 2 glass doors and a center cabinet drawer. Offering a variety of open and concealed storage options this timeless bench is perfect for all of your A/V components and accessories and can accommodate most TVs up to 80Inch. Easy to assemble so you'll be set up in no time. Enjoy the innovative and easy to assemble design of the Quick Click TV Bench from the Milan Collection. Large open shelves provide a generous platform to house all of your A/V components while maintaining optimal airflow. Black tempered safety glass shelves and Dark Espresso stained real wood veneer uprights present a transitional modern style perfect for any space. This Sonax Bench has been crafted with special attention to detail making it easy to click together with no outside tools required. Bring home this contemporary furniture by Sonax, furnishing your home doesn't get any easier than this. 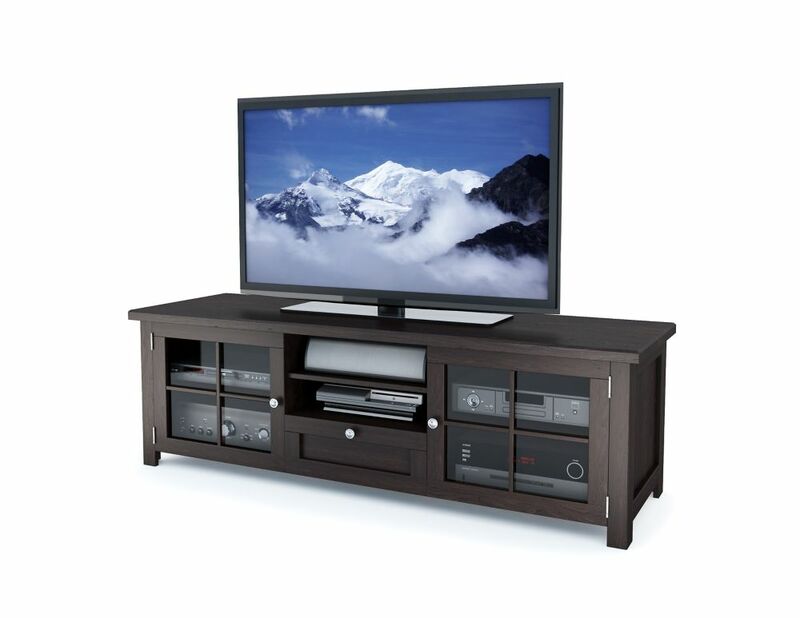 B-098-BAT Arbutus 63 inch Dark Espresso Stained Wood Veneer TV Bench Attain the ultimate home theatre display with this stunning Shaker style design from the Arbutus Collection. Featuring adjustable shelves and wood framed tempered glass doors this new TV bench is the perfect platform for TVs up to 70. With a variety of open and concealed storage solutions this bench is the perfect way to maximize your living space while adding style to your home theatre display.